One of Liverpool’s most iconic theatres is set to showcase its exclusive Summer School for young performers. From July 27 – August 1, The Epstein Theatre on Hanover Street will see hundreds of budding actors descend on the infamous grand stage, to be given taster of what it is really like to be in the spotlight. Following the auditions, which are set to take place at the theatre on June 7, all participants aged 6-18 will be allocated a part and given a script to learn ahead of the special six-day production. General Manager Rebekah Pichilingi said: “As a theatre that has welcomed thousands of acting, music and comedy talents from across the globe – it’s great to be able to offer an experience for local youngsters with a passion for theatrical performance. Regardless of their levels of experience, children and teens will undergo casting, coaching and a series of live performances, to ensure that they receive a ‘well-rounded’ experience. Rebekah added: “With the summer holidays fast approaching, it can be tough to keep youngsters amused throughout the lengthy period, and with that in mind, this unique experience will certainly keep them entertained. 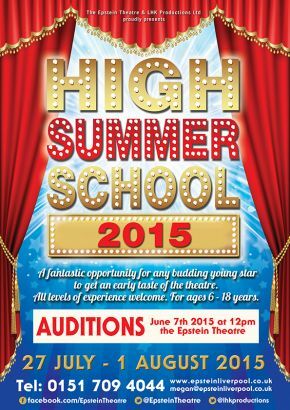 Auditions for the Summer School will take place at The Epstein Theatre on Sunday, June 7 at 12pm. The Summer School will run from Monday, July 27-Saturday, August 1. For more information visit www.epsteinliverpool.co.uk or contact 0151 709 4044.